Home | Blog | What Is MRT/MRS Certification? If you are faced with mold contamination in your home or business, you will want an effective mold remediation service that eliminates growth and prevents it from coming back in the future. However, many mold removal professionals are under-qualified and not equipped with the right skills or knowledge to properly address mold. When choosing a mold remediation company, you need highly qualified technicians with knowledge of best practices and experience in the industry. So how do you know that a mold remediation technician is qualified for the job? At Tuckey Restoration, Inc., our mold remediation professionals have MRT and MRS certifications that attest to their experience and knowledge in the mold remediation industry. These advanced certifications require continuing education and verifiable experience, making MRT- and MRS-certified technicians equipped to effectively address mold in residential and commercial buildings. Read on to learn about each certification and why they are essential for high-quality mold remediation services. The Mold Remediation Technician (MRT) certification is for professionals in the mold remediation industry who want to advance their skills and knowledge through continued education. The MRT certification is offered by the Restoration Industry Association (RIA), a professional trade association that represents over 20,000 restoration and cleaning professionals from over 1,100 firms around the world. RIA is the largest and oldest non-profit professional trade association in the restoration industry and is committed to promoting industry best practices, providing leadership and advancing knowledge in cleaning and restoration. To obtain an MRT certification from the Restoration Industry Association, candidates must complete a three-day training course through Wonder Makers Environmental, a company dedicated to solving indoor environmental problems for homes and businesses. The MRT certification course prepares candidates for setting up a variety of mold remediation projects they may encounter in homes or businesses. 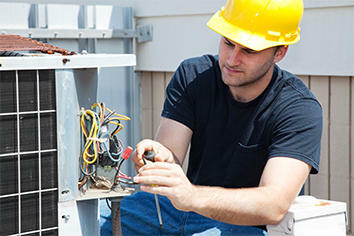 The course teaches how to accomplish the cleaning and removal tasks necessary for each project. Through hands-on training and classroom discussion, MRT-certified technicians learn the skills necessary for residential and commercial mold remediation. To qualify for registration in the MRT certification course, candidates must also complete five years of work experience or three years of supervisory experience in the mold remediation industry. Acceptable work experience includes project supervisor, restoration worker, consultant, estimator, inspector, facility manager, restoration instructor and restoration company manager. Candidates must be able to provide verification of sufficient work or supervisory experience before registering for the certification course. After completing the prerequisite work experience and passing the MRT certification course, candidates receive a certified certificate from the Restoration Industry Association. Some mold remediation professionals pursue a Mold Remediation Technician certification as a stepping stone to becoming a Certified Mold Professional (CMP). The CMP certification is an advanced certification that focuses on strategies for improving indoor environmental quality by identifying various factors and contaminants that impact building systems. To obtain a CMP certification, candidates must complete the Mold Remediation Technician course as well as a Mold Remediation Supervisor course. The Mold Remediation Supervisor (MRS) certification is another certification of advanced knowledge and skills in the mold remediation industry. The Institute of Inspection Cleaning and Restoration Certification (IICRC) developed the MRS certification as a standalone certification exam for mold remediation professionals. The IICRC is a non-profit organization that establishes certifications and standards in the restoration, cleaning, inspection and installation industries. As a globally recognized organization, the IICRC creates and shapes policies that direct the restoration industry. MRS certified technicians who have successfully completed the certification exam will have the necessary knowledge and skills for residential and commercial mold remediation. The MRS certification verifies that a mold remediation professional meets all state requirements for licensing and is qualified to perform mold remediation in a variety of building environments. After obtaining an MRS certification, individuals must complete a re-certification exam every five years to renew their certification. This ensures that mold remediation professionals with an MRS certification remain up-to-date with industry protocols and understand current best practices and quality controls in the mold remediation industry. The MRT and MRS certifications help ensure that professionals in the mold remediation industry adhere to standards of care and follow correct protocols for quality mold remediation. Through continued education and instruction, candidates for MRT and MRS certifications improve their skills and learn more effective practices for mold remediation. When performing mold remediation, providing effective services is essential. If mold is not remediated properly, mold growth may persist, or the underlying problem may allow mold to resurface in the future. Because both MRT and MRS certifications are provided by trusted organizations in the mold remediation industry, the education that candidates receive reflects up-to-date knowledge and current best practices in the industry. When hiring a mold remediation specialist, home and business owners should seek professionals with ample experience and knowledge. The MRT and MRS certifications both reflect demonstrated work experience and tested knowledge. A mold removal specialist with an MRT or MRS certification will be knowledgeable about the best chemicals and cleaning materials to eliminate mold in your home or business. They will be able to cleanse the air of mold spores in addition to remediating physical mold. What Does It Mean That Tuckey Employs MRT/MRS Certified Technicians? At Tuckey Restoration, we are proud to employ experts in the mold remediation industry — our team includes mold removal specialists with MRT/MRS certifications and years of experience in the field. 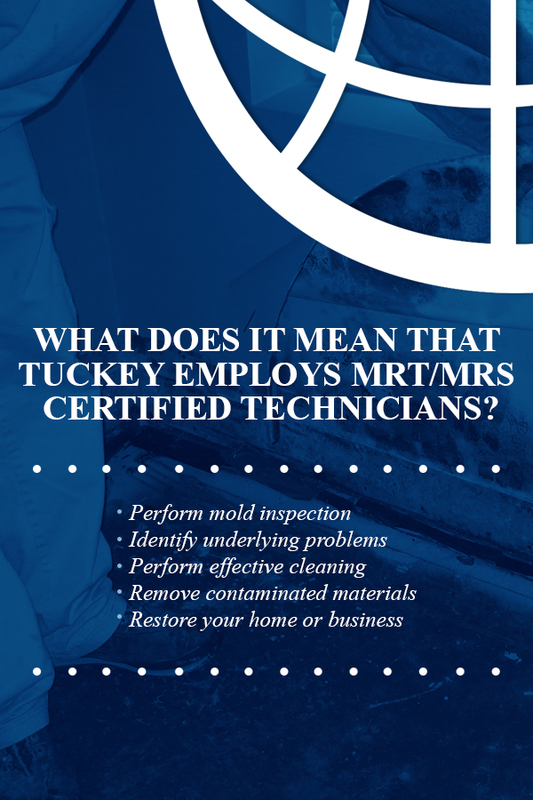 Tuckey MRS- and MRT-certified technicians always adhere to industry best practices for mold remediation and are equipped to tackle mold contamination in a variety of situations and structures. Perform mold inspection: If you are concerned about potential mold growth in your home or business, Tuckey Restoration can perform a complete assessment to locate any fungal growth or mold contamination. Identify underlying problems: Before performing mold remediation, our specialists will assess the structure to identify the underlying causes of mold growth. Our certified technicians will locate the cause of water infiltration and rectify the root problem. By fixing the underlying issue, we can help prevent mold from coming back in the future. Perform effective cleaning: Tuckey MRS- and MRT-certified technicians will remediate all mold growth and mold spores from your home or business. During the cleaning process, our team ensures mold spores cannot spread to other areas of the building by employing proper containment strategies. Remove contaminated materials: Our team will remove all contaminated or water-damaged materials and dispose of them safely to prevent the spread of mold. Materials that can be preserved will be thoroughly cleaned and sanitized following current industry guidelines. Restore your home or business: Tuckey mold remediation experts are also equipped to repair the structure of your home or business after removing contaminated materials for a complete solution to mold remediation. The advanced knowledge and skills of our MRT- and MRS-certified technicians allow them to identify the best mold remediation solution for your home or business. Tuckey Restoration performs fast and simple methods for safe and effective mold remediation. At Tuckey Restoration, we are proud to offer professional mold remediation services to the South Central Pennsylvania region. Tuckey Restoration also offers comprehensive restoration services for all of your residential and commercial needs, including air duct cleaning, preventative maintenance and restoration of damage from fire, water, wind or storm. Tuckey Restoration’s complete restoration capabilities allow us to provide a total solution to mold remediation by addressing related problems and repairing your home or business after contaminated materials are removed. Tuckey Restoration offers professional air duct cleaning to reduce mold spores and dust that can collect in your air duct system. As part of comprehensive mold remediation, air duct cleaning can help protect against mold recurrence to help ensure the health and safety of your home or business. Our damage restoration services also allow us to repair water damage before it leads to mold growth. The Tuckey Companies have provided professional trades-related services since 1968 and are trusted local leaders for residential and commercial construction specialties. If you are seeking mold remediation or other restoration services in South Central Pennsylvania, explore our restoration services or contact us to learn more.